Canadian men live on average, 4 years less than their female counterparts. Men are more likely than women to have obesity and are at a greater risk for preventable chronic diseases such as diabetes, heart disease, and cancer. Established in 2014, Hockey Fans In Training (Hockey FIT) was developed to address this growing health inequity and provide men with the tools and resources to change their lifestyle for the better. 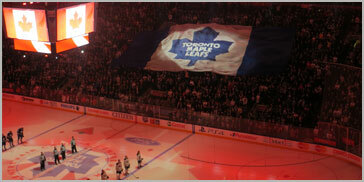 When you think of Canada, you think of two things: 1) we apologize a lot, sorry for that; and 2) we love HOCKEY! Hockey FIT capitalizes on the idea that hockey can lead to positive behaviour changes off the ice too. The results from our pilot research project confirmed Hockey FIT was both an acceptable program for men who are overweight or obese, and effective in helping these men lose weight and keep it off. Our Hockey FIT Research Team, led by Principal Investigator and General Manager, Dr. Rob Petrella is based out of Western University in London, Ontario, Canada. Our core research team is made up of researchers and program staff with a range of expertise from sports management to epidemiologists measuring the behaviour changes we see in participants. Check out the hockey cards below for inside scoop on our research team. Scientist/Adjunct Assistant Professor at the Centre for Studies in Family Medicine at Western University & Manager/Co-Investigator for Hockey FIT. Favourite Sports Moment: Penny Oleksiak’s unexpected gold medal in the women’s 100m freestyle at the 2016 Summer Olympics! Wendy Blunt, MPH: Research Associate at the Centre for Studies in Family Medicine at Western University & manages quality assurance for Hockey FIT. Favourite Sports Moment: Canadian women’s hockey team gold medal at the 2014 Sochi Olympics. Roseanne Pulford, BA: Research Assistant at the Centre for Studies in Family Medicine at Western University & Advisor to Coaching Experience for Hockey FIT. Interests: Running, skiing, gardening and reading. Adam Gavarkovs, BHSc, MSc: PhD Student at the School of Public Health at Harvard University & manages eLearning Coaches’ Modules for Hockey FIT. Interests: Hockey, golf, and any other sport that can get my heart rate up or keep me thinking. Why Hockey FIT? : Witnessing firsthand the amount of fun the guys have while still learning how to achieve a healthy lifestyle. Dr. Merrick Zwarenstein, MBBCh, MSc, PhD: Professor/Director at the Centre for Studies in Family Medicine at Western University & Co-Investigator for Hockey FIT. Why Hockey FIT? Because what Hockey FIT does, which is engaging communities in research to improve health, is where the puck is going. Dr. Karen Danylchuk, EdD: Professor at the School of Kinesiology at Western University & Co-Investigator for Hockey FIT. Dr. Guangyong Zou, PhD: Professor/Scientist in Epidemiology & Biostatistics/Robarts Clinical Trials at Western University & Co-Investigator for Hockey FIT. Dr. Shannon Sibbald, PhD: Assistant Professor at the School of Health Studies/Centre for Studies in Family Medicine/Schulich Interfaculty Program in Public Health at Western University & Co-Investigator for Hockey FIT. Favourite Sports Moment: Seeing my kids participate and be proud of their accomplishments.